With a chapter by Joan Klagsbrun, Ph.D., Certified Focusing Professional, "Eugene Gendlin: River of Knowing; A Journey with Focusing." Connecting to our inner lives can foster healing, self-development and self-awareness. 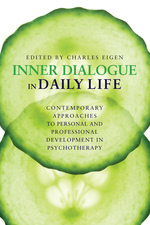 This unique book looks in depth at ten major contemporary psychotherapeutic approaches which all use inner dialogue as a way of developing both professionally and personally. Each chapter is written by an expert in their field, some of whom were chosen to contribute by the founder of the approach. The authors include personal stories of how they have used the approach in their own lives and work as therapists, giving a deeper insight into each method. As well as developing a connection to the mind, several of the approaches focus on deepening an awareness of the body and listening to its voice. Approaches covered include the Jungian approach, Gestalt therapy, Focusing, internal family systems therapy, and Hakomi. Drawing on both Eastern and Western traditions and methods, this fascinating book will be of interest to psychotherapists, counsellors and students, as well as anyone with an interest in inner dialogue, healing and personal development.